Day 4: Tisaling to Ponganagu. And this Ladakhi wonder is the biggest reward of this trek. Throughout the 10-day trail, trekkers have the company of landscapes that are so outlandish, they don’t seem to belong from this world. It’s a starkly beautiful trail that no other trek can replicate. It is highly recommended that you rest for a day at Leh to acclimatise (not only during this trek, but during any trek in Ladakh). Walk around within Leh to get yourself better acclimatised. This should be taken more seriously by those planning to reach Leh via flight. At any point, do not attempt to start the trek if you feel unwell. Note that one can also choose to head to Rumtse on Day 2 and spend one night there for acclimatisation purpose. Rumtse has camping grounds where one can pitch tents. One can also opt for local home stays by paying anything from Rs. 400 onwards for a room. Just one kilometre ahead of Rumtse is Jammu & Kashmir Tourism Lodge, towards the left of the Manali-Leh road. One can choose to stay there as well. Rumtse is 79 km from Leh. It takes around 2-3 hours to get there on the Leh-Manali road. It’s a pleasant journey with great views of the Indus Valley and monasteries of Hemis, Thiksey, etc. Rumtse is a small village. It lies in Rupshi, which is a valley sandwiched between Zanskar, Tibet and Ladakh. The local monastery near Rumtse, Gya, has as many as 108 stupas and is over 700 years old. Being in close proximity from where the Changthang plateau begins, it is the base camp for treks to Tso Kar and Tso Moreriri Lake. Walk down for a kilometre on the Leh-Manali highway from the Rumtse local market. Take the trail towards your left. 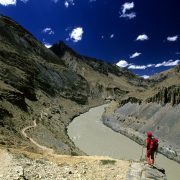 Pass by J&K Tourism lodge and hike alongside the Chhaba Chu stream, which will flow on your left. After 10 minutes, spot a steel bridge. Cross the bridge with the stream on your left and keep left, along a small plateau. The dusty trail will eventually take a U-turn as you leave Chhaba Chu and enter Kyamar valley. This point is a confluence of Kyamar stream and Chhabu Chu. Leaving behind Chhabu Chu, look for multiple rivulets. These are small streams and can easily be crossed. After 20 minutes of level walk, make note of large green marshes on your right, suitable for camping. Here, cross the stream and take the trail going left. The walk to Kyamar campsite is easy and over relatively flat terrain. The altitude gain for the day is roughly 1,224 feet (373 metres) only. The trail swirls inward along the natural scope of the valley. A hike of 30 minutes will lead to a change in landscape. The green marshes give way to gravel. There is a small gradual ascent over a rocky spur. After 10 minutes, you will reach the base of this plateau. From here, observe a 3 way opening of the valley. Take the widest valley in front of you. This is the logical trail going to the grazing grounds of Kyamar. After walking for 30 minutes, the green marshes will re-appear along Kyamar stream. The river basin remains on your right. The Changpa nomads are known to camp here during summer. The trail to Kyamar can also be covered in an SUV. The Kyamar valley is wide with vast marshlands. You will be required to cross the stream towards the right and then back to the left side as per the trail in front of you. The stream-crossing can be negotiated easily. This section of the valley will take 45-60 minutes to traverse. Ahead of you, observe the highest mountain with snow on its summit. The Kyamar grazing grounds are located at the base of this summit. It will take around 3o minutes to reach the base of this mountain. From here, one can see the beginning of Kyamar green pasture land. It is advisable to trek towards the end point of these grounds. The final section of the trek will take 45-60 minutes. Look for a suitable camping spot next to the stream, which is on the right side of the trail. Kyamar’s grounds are surrounded by beautiful rocky hills on three sides of the valley. You’ve got a long day ahead. Start early, by taking the trail going to the base of Kyamar Mountain. Cross the stream and re-join the trail coming from Rumtse. From the base of the mountain, walk on the trail that naturally curves left. The green landscape is left behind as you now enter the barren mountainscape of the upper plateau of Kyamar. The trail now gradually climbs up as you approach the base of Kyamar La. A 20 minute hike will have you reach the centre of the valley. From here, take the wide SUV trail on your right. Spot a rocky structure on the trail and cross the structure from its left. You now can see the base of Kyamar La straight ahead of you. Towards your right is Kyamar Nallah, which dries up every summer. There is a lot of distance to cover to reach the Pass. Looking back, observe the Zanskar ranges, especially Mt. Kang Yatse, which looks stunning. It takes an hour to reach the base of the pass. Observe a small bridge made of boulders and stones over Kyamar stream. Cross over and take the trail that winds upward on your right. From here, it’s a steep ascent all the way to the pass. The final section of the ridge is littered with tiny wild flowers. Kyamar Pass is a high altitude gravel saddle. Generally, there is no snow on the pass in summer (July-August). Towards its left is a mountain top, with a temple dedicated to lord Shiva. There are prayer flags at the summit of the pass. The 360 degree view from the pass is mind-boggling. Leaving Kyamar valley behind, take the trail going downwards on the right side of the ridge. It’s a level walk for 15 minutes, after which the descent becomes sharp. Make note of the river bed of Tassa Phu below you. The trail is slippery, with loose gravel. If raining, extra care should be taken while descending. It takes 30-45 minutes to climb down to the river bed. Take the trail going towards your left as you reach the river bed. Cross Taasa Phu. Observe two valleys that open in front of you. Take the one that is on your immediate left. 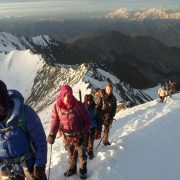 The ascent towards Mandachalan La is a brutal and laborious slog of 950 feet. This section has a healthy presence of Himalayan Ibex, Marmot and Wild hare. The initial section has a gradual ascent till the base of the pass. The climb up to the pass may take anything from two to three hours. The terrain is all dry, with no snow. It does get very hot in noon, so make sure to stay hydrated and not over-exert yourself. Expect the temperature to be around 35 degree Celsius on a sunny day. Mandachalan Pass is well-marked with cairns and prayer flags. The view from the top is a notch better than Kyamar La. Observe the connecting ridge, below which lies Tisaling, your destination for the day. Towards the north, the high peaks of Pangong region watch over the valley. Go ahead on the right side of the ridge into a bowl-shaped valley. The trail is a level-walk of 2 kilometres. It leads all the way towards the summit of an un-named pass. From the pass, look for the green camping ground of Tisaling below. Feel free to break trail and descend towards the camping ground at Tisaling. You will have to cross the stream and the marshland for a suitable spot for camping just at the base of Shibuk La. Tisaling is beautiful high altitude grassland between Mandachalan and Tisaling Passes. Start early in the morning to avoid the brutal afternoon sun. The initial part of the trek involves a short and steady climb to Shibuk La, which is adjacent to the camp site. The approximate distance to the top of the pass is 1.5 km. The altitude gain is over 950 feet. Cross the stream and head to the base of Shibuk La. The trail moves south-east and the pass is clearly visible above. There are several ways to reach the summit. The straight route requires you to cross the stream towards your left and make a straight line upwards to the summit. This route is the shortest. However, the route has the maximum incline and is strenuous. The other way to go about it is to take the left side trail and reach the crest of the pass. This is a longer route but the ascent is gradual, at least initially. It takes about an hour to reach Shibuk La. The view of the Tisaling camp site from here is stunning. So is the vast Tso Kar valley that stretches out right ahead of you. One can also catch a glimpse of the salt lake, Tso Kar, in the distance. Mt. Thugse (6,050 m) and Mt. Gursan (6,370 m) stand prominently at the horizon. The descent from the pass to Tso Kar Lake is rapid, as you pass by a fertile stretch of land. The land here is frequented by Changpa nomads, who come with their livestock. From here, the hike to Pongunagu takes 4-5 hours. After an hour, a rocky scree-filled trail awaits you. 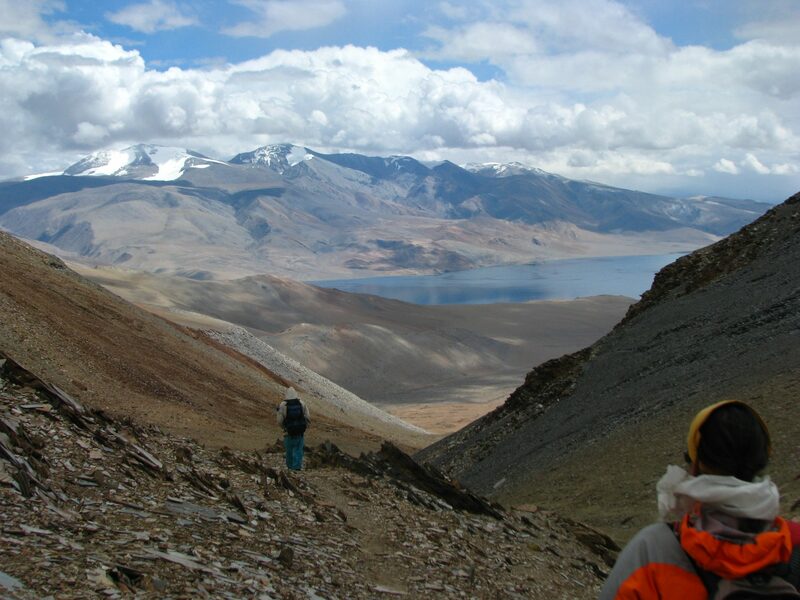 The view of Tso Kar lake basin is closer than ever as you descend swiftly. 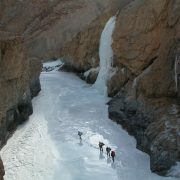 About 2-3 hours into descent, you will exit Shibuk La valley and enter Tso Kar region. Follow the trail on your right and exit the valley. The trail here is well-defined. The brackish barren land has a unique array of colours that keep changing as the day progresses. As you approach the rocky spur, there will be a series of two crests of the plateau that need to be traversed. This will take 30-45 minutes. Once at the top of the plateau, follow the trail that winds right. After 15 minutes of level walk, observe the whole Tso Kar Lake below. A motorable road is visible below. It comes from the Leh-Manali road. This road goes east, crossing Polokongka La and descends to Puga Valley. It then heads south to Tso Moriri Lake. Towards the far right, after crossing this road is the campsite of Pongunagu. It takes 20 minutes of brisk walking to reach the camp site. Take the trail from the left side of a large fenced grazing ground to reach the camp site. This is the shortest route. Pongunagu has place for pitching tents. It also has ready-to-use tents on rent. A satellite phone is also available in a nearest village, Thugje, 3 km away from the camp site. The camp is connected via a motorable road. Private vehicles need to be arranged from Leh in advance if required. Today is a relatively easy day for trekking. Take the trail going south, facing the bank of Tso Kar lake. With the lake towards your left, the Jeep trail is a pleasant one. Lookout for black necked cranes and Brahminy ducks. The trail passes by a few tea shops and winter shelters used by Changpa folk. The valley widens as you walk towards Nuruchen, a Changpa village. Looming ahead are towering Zanskar ranges, where you can easily spot the Horlam (Kongka) La ridge. The trail has gentle ascents with level walks for most of the day. Although it’s an easy walk, it’s a long walk all the way to Nuruchen, which is used as a safe haven during bone-chilling winters by Changpas. During summer, Nuruchen looks like a ghost village with abandoned huts. There is a refreshing stream gushing down from the Horlam La ridge, from the south west side. The rivulet is known as Nuruchen Lungpa and drains into the Tso Kar Lake. Pitch tents near the stream for the night. Today’s trek is a fairly simple one. 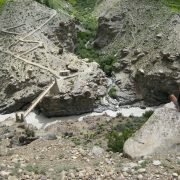 Horlam La is the easiest pass crossing in this trek. Ford the Nuruchen rivulet and proceed further south west into the Tso Moriri Valley. The ascent to the pass is gradual. Look back for a gorgeous view of the turquoise blue Tso Kar Lake. Notice an increased presence of Changpa nomads all the way to their settlement in Rachungkharu. Also, Kiangs, Tibetan wild horses frequent this trail often. The trail is gravel and scree with short wild grass. The approach to the pass is easy, with wide expanses suitable for SUVs to drive by. From the top of the pass, there are great views to fathom. Reaching the pass is not that significant, compared to what is in store ahead. Descend to the grassy marshes of Spanglung Serpa river basin. A forty minute downhill ridge walk will have you reach the mushy marshes of the river basin. Avoid walking on the slushy side of the marshland. Look out for a suitable spot to ford the river. The trail now takes you on a five kilometre stretch till the campsite of Rachungkharu. Camp next to the river for the night. Rachungkharu is a suitable place to rest for a day. 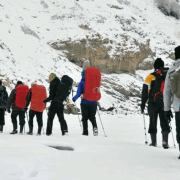 The next two days are going to have difficult pass crossings and a rest day helps the team to recuperate from the rigour of trekking at such high altitude. Expect a long day of trekking. Today, you have two of the most formidable pass crossings in store for you. The other challenge of the day is fording a series of rivulets, including a few of them that can be tricky. Start early. Take the clear-cut trail to Kyamayaru La, moving south. Follow the left course of the passing rivulet as you approach the base of the pass. After around an hour, spot the saddle of Kyamayaru La on your right. Take the trail ascending all the way to the pass. It takes an hour to reach the top of Kyamayaru La. Looking back, visually retrace the ridge of Horlam La. Tso Kar lake is also visible behind Horlam La. If you look south, Kang Yatse is visible at a distance. Ahead of you lies the wide valley of Gyam chu. Descend to the extensive river basin of Gyam Chu. As you reach the first river, walk beside it until you reach pasture grounds used by yak herders. Ford the river from here and move ahead into Gyam Chu basin. Below snow-covered Mendok ranges in the distance, observe several plateaus. Gyamar La ridge is in middle of those plateaus. The trail may have yak carcasses lying around. The ascent to the pass is steep. Keep a slow and steady pace as you approach the pass. It takes close to two hours to reach the top. The pass has several prayer flags neatly laid out. The Mendok ranges (1 & 2) can be seen distinctly in a southern direction from here. Descend from the pass towards the arid side of Gyamar basin. As you reach the banks of the stream, brace yourself for an exhilarating experience of river-crossings. The rivers here are voluminous and deep. Try boulder hopping or wade through the deep currents. The second river crossing appears shortly after the first one. After crossing the river, do warm up and dry yourself. The water is icy cold. From here, head south, towards the convergence of rivulets that form the Gyamar River. Gyamalhoma campsite is across the river. Walk towards the bank of the river and prepare for the last river crossing of the day. Gyamalhoma is a beautiful pasture ground frequented by Changpa yak herders. The place makes for an excellent camping spot. It is the base camp for climbing Mendok 1 and 2 peaks. Today’s sceneries are the best you’ll see on this trek. Prepare to cross the highest pass of the trek. Yarlung La is located at an elevation of 17,841 feet and has best views of the trek to offer. Take the marked trail heading south east of the river valley. About an hour of level walk over receding pasture land, will have you enter a rocky landscape. The valley is barren and prone to rock fall. Ford over a few gentle rivulets. There are cairns on the trail that keep you from getting lost. The plateau of Mendok will come into view after around 2 hours. The saddle of Yarlung Nyau La is now clearly visible ahead as you gain altitude. As you go higher, the dusty wind hits you in thunderous bursts. As you reach the top, the first appearance of Tso Moriri lake is an overwhelming sight to fathom. The lake is huge and dominates the landscape. Some famous trek-worthy peaks like Chhamsher Kangri (21,725 feet) and Lungser Kangri (21,870 feet) are clearly visible from here. Standing at the highest point of the trek, bask in the view for a while before descending. The descent to Tso Moriri lake loses altitude by 3,000 feet. Hike all the way up to Karzok, which is located at the bank of Tso Moriri. An hour of descent will bring you to the pasture land of Karzok Phu. They are summer grazing grounds of Changpa nomads. The trail from here winds through an arid desert valley, beautiful in its own accord, all the way to Karzok. The bank of the stream that drains into Tso Moriri has some green marshlands. Walk for another two hours at a steady pace to reach the camping grounds of Karzok next to the stream. Towards your left, observe an ancient 500-year-old Buddhist Monastery of Karzok. The satellite phone booth is adjacent to the Monastery property. Camp at the designated camping area for the night. The trek ends at Karzok. Drive back from Karzok to Leh. The road journey to Leh takes 6 to 7 hours.